Get the deepest insights possible from your data. Snowflake Centre of Excellence in EMEA provides accelerated deployment, best practice design for AWS and managed data services. LONDON, United Kingdom, February 5th 2018 — Snowflake Computing, the only data warehouse built for the cloud, today announced the launch of the Snowflake Center of Excellence by Datalytyx, a leading big data engineering and consultancy company. The Snowflake Centre of Excellence by Datalytyx emerged for the rapid deployment of cloud-built data warehouses so enterprises can achieve rapid time to market, without the time-consuming and expensive infrastructure or consulting associated with on-premises and “cloud-washed” solutions. The Centre of Excellence is the ideal solution for enterprises that want immediate, hands-on experience with Snowflake to gain all the benefits of the no. 1 cloud data warehouse. Snowflake and Datalytyx have already achieved significant success with a variety of customers that span numerous industries. Datalytyx has supported Snowflake in many client projects including a modern provider of GPS vehicle tracking and fleet management services, and a provider of deep data analytics and insight consultancy that helps developers build computer games better. Additionally, Snowflake and Datalytyx have ongoing engagements within energy, distribution, media, construction, retail and many other sectors. Trained data specialists – Data management experts trained on Snowflake, Talend, AWS and other cloud providers. Proven methodology – Datalytyx consulting, experience and best practice design as a result of successful data warehouse, data analytics and big data implementations. Data visualisation and data science – The ability to visualise data rapidly within modern tools, and access to data science specialists to help uncover valuable insights. Reduced time to value – Hands-on delivery for data migration, data ingestion and data processing so customers can reduce their time to value from months to days. Snowflake is the only data warehouse built for the cloud. 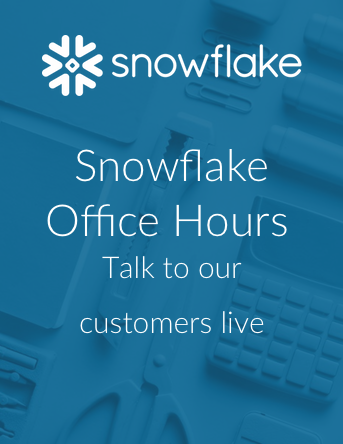 Snowflake delivers the performance, concurrency and simplicity needed to store and analyze all data available to an organization in one location. Snowflake’s technology combines the power of data warehousing, the flexibility of big data platforms, the elasticity of the cloud, and live data sharing at a fraction of the cost of traditional solutions. Snowflake: Your data, no limits. Find out more at snowflake.net. Datalytyx is a leading provider of big data engineering, data analytics and cloud solutions. Datalytyx specialises in deploying data driven solutions and designing and implementing modern data architecture. We deliver solutions to a diverse set of clients and business cases with industry leading partners including Talend, Snowflake, Cloudera, Ephesoft, AWS, Azure, Tableau, Zoomdata and ThoughtSpot. Visit www.datalytyx.com to learn more. Thank you for subscribing to Snowflake Communications.